Did you know that a significant quantity of Scottish literature — novels, short stories, poetry and drama — has been translated into over seventy languages? This is an astounding statistic, and one that raises some serious research questions. Some authors are more popular than others — finding out why offers some insights into Scottish literature that may be otherwise overlooked. Initial thinking might focus on the desire to share ideas of national progress, whether through political struggle or philosophical teaching. 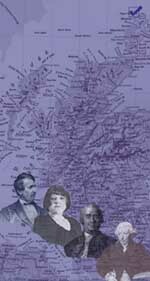 The popularity of translations of Ossian, Burns, Hume and Walter Scott indicate a range and depth of Scottish literary production that has transcended borders. Translations of more recent Scots authors — R.D. Laing or A.S. Neill, for example — reflect continuing international interest in medical and educational material. We can point to a scholarly resource that lists over 30,000 works of translation covering an assortment of categories: literary fiction, children’s books, crime novels, fantasy, science fiction, philosophy as well as non-fiction works, whether written in English, Scots or Gaelic. BOSLIT or The Bibliography of Scottish Literature in Translation is an online database hosted by the National Library of Scotland. BOSLIT started off in 1994 as an online catalogue of translations dating back to 1494 and, although no database is ever complete, scholars have been gradually amassing a wealth of data. It is free to access, is especially strong in prose works published before 1800 and contains relatively comprehensive information on those publications issued before the end of the twentieth century. Currently, plans are underway to strengthen the database significantly. These include improving access to older material, possibly through digitization of texts held in Scottish libraries, and adding links to examples of online translations. Increasing the coverage of important twenty-first century works is also clearly necessary. Just now, BOSLIT includes information about authors such as Hugh MacDiarmid, Edwin Morgan and Alasdair Gray as well as Muriel Spark, A.L. Kennedy and Louise Welsh. Research access to this material demonstrates that Scottish writing has a history of crossing national borders in possibly unique and unexpected ways. There is tremendous scope for the further study of literary, historical and scientific translations. In addition, new developments in the field of digital humanities have increased our awareness of BOSLIT’s value as a digital resource available to scholars, librarians, translators, authors, publishers and readers. For more information contact Zsuzsanna Varga at Zsuzsanna.Varga[@]glasgow.ac.uk or Andrew Martin a.martin[@]nls.uk, Curator of Modern Scottish Collections at the NLS, and be sure to visit us on Facebook.